Home / DVDs / Salsa or Bachata STARTER KIT!! Salsa or Bachata STARTER KIT!! Get your Salsa or Bachata STARTER KIT today! A $428 Value for ONLY $59!! PERFECT for the BUDDING DANCER, OR… Birthdays, Weddings, Mother’s or Father’s day, or just in time for the Holidays!! Free Online or In-Person Workshops and Bootcamps!! SEVEN (7) FREE Beginner Instructional Dance DVDs in download or hardcopy format! Includes: Step-by-Step Basic Beginner Steps, and Spinning Techniques! 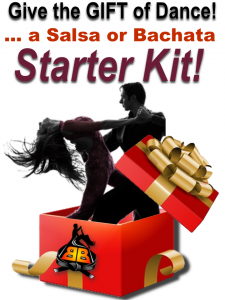 2 reviews for Salsa or Bachata STARTER KIT!! Edie’s posture brace is incredibly comfortable. It is by far the best posture brace I’ve ever worn. Awesome Christmas gift! Really great idea.